Apple new iPads: iPad Air, iPad Mini retina features, price, release date. The new iPad Air weighs just 1 pound. That’s impressive, but will consumers really care? Apple today introduced its first new iPads in a year, and they’re mostly about what people expected, with two exceptions. One is that the company’s new high-end tablet doesn’t come with Touch ID, the fingerprint-sensing technology that Apple introduced in its new iPhones last month. And the other is that it’s really, really light. It’s called the iPad Air, and it weighs just 1 pound. That’s down from 1.4 pounds in the last version, which may not sound like a whole lot, but represents serious feats of engineering and design. 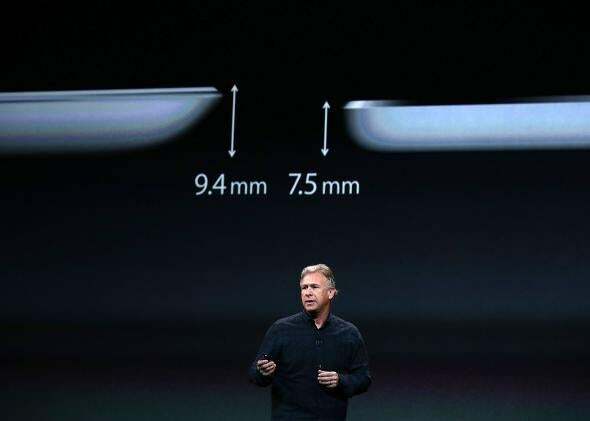 There’s an awful lot of electronic equipment squeezed into a frame that’s just 7.5 millimeters thick, and no doubt Apple marketing executive Phil Schiller was telling the truth when he said the company looked for anyplace it could shave one-tenth or one-hundredth of a millimeter off of a component. “To make an iPad this thin took an enormous amount of work over years,” Schiller said. The question is: Was it worth the trouble? The original “Air” in Apple’s lineup, the Macbook Air, has been a hit. But that’s because weight is a serious issue when it comes to laptop computers, many of which are heavy enough to make people think twice before deciding to lug them around all day. Is there anyone out there who had the same misgivings about the 1.4-pound previous-generation iPad? This may be a case in which consumers see diminishing returns from Apple’s engineering exertions. On the other hand, the approach clearly differentiates Apple’s new tablet from those of, say, Microsoft, whose chunky Surface 2 weighs almost 50 percent more. * And it is true that the iPhone 5, which resulted from a similar focus on lightweight design, gains an almost surreal, futuristic feel from its lightness in your hand. Schiller insists the iPad Air will likewise dazzle people when they pick it up. The company’s first ad for the device shows off its thinness by concealing it behind a pencil. Yet consumers for whom lightness is an object already had a better option in Apple’s tablet lineup: the iPad Mini, which weighs just two-thirds of a pound. Apple also unveiled a retooled iPad Mini on Tuesday, the iPad Mini with Retina Display. Strangely, though, that one weighs a little more than its predecessor, at close to three-fourths of a pound. All of this matters quite a lot for Apple, which is hoping the new gadgets can help it reverse a startling slide in iPad sales, from over 19 million in the second quarter of 2013 to just 14.6 million last quarter. The iPad Air will start at $499 for the Wi-Fi version and $629 for one with cellular technology. The iPad Mini with Retina Display will start at $399 and $529. Both of the new products feature 64-bit A7 chips, like the company’s new iPhones. The iPad Air will be available on Nov. 1, with the new Mini coming later in the month. Apple will still sell its existing iPad 2 for $399, and the original iPad Mini for $299. *Correction, Oct. 22, 2013: This article originally stated that Microsoft’s Surface 2 weighed twice as much as the new iPad. In fact, it’s the business-focused Surface Pro 2 that weighs nearly two pounds, while the Surface 2 weighs a shade under 1.5.